The picture really doesn't do justice to the true colors, but you get the idea. I finally finished stitching the last block from the summer BOW from Primitive Gatherings and will share a picture of it next time. I received the finishing kit and it did not disappoint - the wools are wonderful and the flannel for the setting triangles and border are a much deeper, richer red than what the pictures online look like. I have the six setting squares prepped and ready to stitch. They are simple hearts with stars, so they shouldn't take long (famous last words, right?). Pumpkin pendants have been flying off the shelf as well. Now I really need to go shopping for some more orange fabrics! I've been really busy with "Charming" - you remember these are the charms from the first month. I am almost finished piecing the second installment of charms, but the pattern is a secret, so I can't show them here just yet. We still have to do the glass work on all of them, so we will be busy for awhile! And, I'm still not caught up with my Non-Farmer's Wife blocks (shocking, I know!). Only 3 behind at this point - so I can handle that. That's what I've been up to - are you all keeping busy? Now it's off to the dreaded treadmill! This is my little 4 year old grandson, Kaden - isn't he the cutest thing? 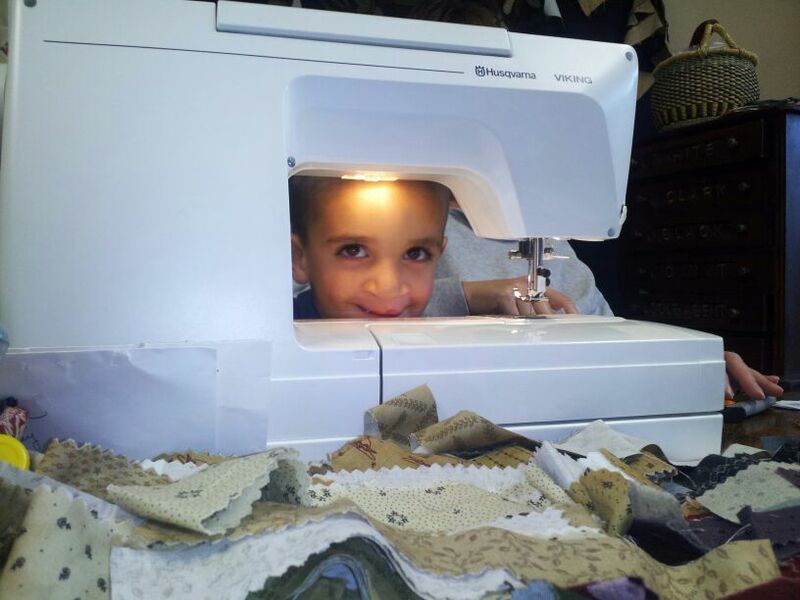 I love this picture of him peeking through my sewing machine. He came to visit the other night, and he always wants to "make something for Dad". I need to come up with some ideas of things we can make (all ideas are welcome!). I had some Iowa Hawkeye fabric, so we made little 2" pillows. Not too exciting - but he had fun and that's the main thing! I sure wish I could capture the real color of these fabrics - I don't think any of my pictures are even close and these seem to be extra-bad. The true background is a nice rich tan and these reds are not as orange as they appear here. You can ask MTM (that would be Marty, the mail lady!) - she was surprised when she saw them in person - they are much better! Speaking of MTM - we went to the AQS show in Des Moines together last week. 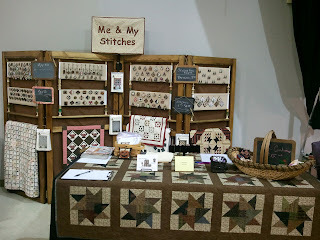 We had a really great time - saw lots of goodies in all of the vendor booths and so many really beautiful quilts. We both had amazing restraint and really didn't buy all that much. I bought some thread, a gift that can't be talked about here, and a little tumbler ruler/template. That is an all-time record! I usually go crazy and buy lots. And it's not that there was nothing tempting...I just really am trying to restrain myself. My stash closet is stuffed and I haven't finished a single thing that I bought on my trip to Wisconsin this last spring. Realistically there just isn't a thing that I need. Marty found a few things - one was a really nice fall wool table topper. I thought she was turning over a new leaf, and was going to learn how to do wool applique, but she had other things in mind - she is hoping that her mom will make it for her! She enjoys hand work and I'm sure will do a great job - I can't wait to see it finished. I always love meeting new people and visiting with old friends at quilt shows. I delivered a jewelry order to the girls of Yellow Creek Quilt Designs. They always have an attractive booth. I absolutely love all of their designs and color choices - SO TEMPTING! There are a couple of their patterns that I've had my eye on forever, but I restrained! We also chatted with Rita from Quilter's Station - she, too really tempted me. Her booth looked amazing and was one of my favorites. She was the first booth that we visited, and I really intended to stop back by and pick up a few things, but I didn't do it! The bad thing was, I loved everything in her booth - there were some great kits that were really calling my name, but again...I resisted! Not sure I will be able to resist going to her shop in a few weeks when I go to Lee's Summit, MO to vend a show. I met Dawn from Sew Cherished last spring when I was in Kansas City for market. Then we chatted again at the show in Blue Springs, MO where we were both vending. She had a wonderful booth in Des Moines and of course we had to stop and visit (this is where Marty bought her wool kit). I once again resisted all of the temptations (I honestly don't know how I did it!). Dawn purchased some jewelry from me and will be offering it for sale at some of her upcoming shows, so if you see her at shows, make sure to check it out. And look at all of her goodies - she has a wonderful wool pumpkin pillow with a bunch of her crazy stitches on it. I always threaten to take it home with me! I have come so close to buying the kit for it - have had it in my hand several times, but always restrain myself! (you know, one of these days I'm just going to go crazy and buy all of this stuff!). I also met a few of my customers and blog followers who I had never met in person before, so that was really fun. We also got to chat a bit with Lyn from More Sew For You in Omaha, NE. Lyn has been a customer of mine for awhile now, but this is the first time that we have met in person. It was great to chat with her and her booth was also wonderful. She had some nice things that you don't see all the time - some great Sue Daley quilts, among other things. Of course, you can't go to a big quilt show without spending time in the Primitive Gatherings booth! It was awesome, as always! But, again...I showed great restraint! I did buy the little tumbler template there, but that was it. And that is a first, let me tell you! There were lots of other great booths and so much eye candy everywhere. I think sometimes at these shows I just kind of go on overload and don't take in as much as I should. There are several things that I wish I would have looked at closer, now that I'm home. But, it's just as well...did I mention that my stash runneth over?? After the show we were starving (because we hadn't eaten since early that morning when we stopped at the bakery in Pella - YUM! ), and decided to head to The Cheesecake Factory. There are so many choices - it was hard to decide what to order. Finally we each ordered a pasta dish and split them so we could try both. The food was good, the service...not so much! We decided that our waiter must have some other talents and maybe took that job because that is all he could find. He was really bad! But, we had a great time just chatting and enjoying our pasta. The more time we spend together, the more amazed we are at how much we have in common! There are very few things that we talked about that we disagree on - we have very similar tastes in just about everything. We have discovered that our opinions differ on politics, but I don't care much to discuss that anyway! Back on the homefront...I still have not finished my last block from the Primitive Gatherings Summer Block of the Week! I think I just don't want it to end. It is about 2/3 of the way finished, and won't take long at all to complete. The finishing kit showed up on my doorstep (thanks to MTM - haha!) a couple of weeks ago. The kit is just gorgeous - the wools are so rich and deep and the red flannel for the setting squares is much darker and richer in person than what you see on the website. It is just such a great quilt. I really need to get to working on it! I have been doing a bit of hand quilting once in awhile in the evenings. This quilt has been a WIP for a looooong time and at this rate it may stay that way for even longer....Miss CC has made it her napping place! Look at her, hiding her little face. I just don't have the heart to bother her! So, that is my excuse for that WIP staying a WIP for now. So I think everyone must be in the mood for Fall - I know I sure am! I'm sure I have probably shown you this picture before too, but I came across it, and I just can't help myself but to post it. This is Callie when she was very little. I think she had been tearing around the house like a wild little maniac, and finally wore herself out. Is she not the cutest little thing that you've ever seen? I'm off to the AQS show in Des Moines bright and early tomorrow morning. Can't wait! **I'm linking up with Sarah's Feline Friday blog - make sure to go visit her! Lately I've seen a lot of blogs showing pictures of how they decorate with quilts, often small quilts. It seems that so many people are making small quilts these days, and I love seeing each and every one of them! One of my very first blog posts showed my Wall of Small Quilts, and I thought I would share it again today. I have a bunch more of these, but I like the ones that are up, so I have just left them. I hung them with the tiny applique pins with a silver head, so I could easily take them down and change things around. Maybe some day! What do you do with your small quilts?